Où en sont ils ? Diagonale Groenland is a joint project, involving two expeditions that will meet in Thulé at mid-august 2006. 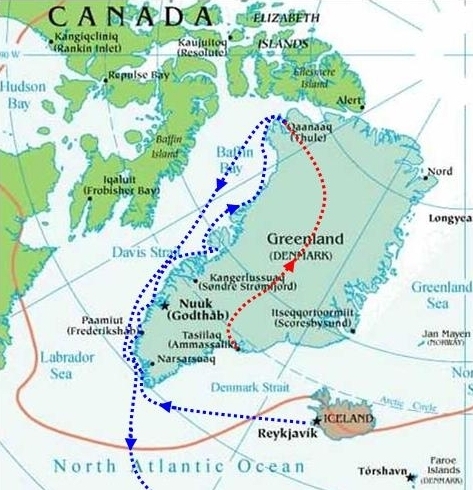 The ski expedition will cross Greenland inlandsis on a diagonal trajectory, from Tasiilaq to Thulé. The maritime expedition will use a sailing boat along the west coast to join Thulé. The meeting of both expeditions in Thulé represents the final objective and a great moment for the participants. The project is organized by Diagonale Groenland, a french association with non commercial purpose. The ski expedition will be in autonomy on the ice cap, for the 2000 km and 60 days, using pulkas and kites. Expedition leader is Pascal Hémon and Fabrice Baptiste is the second participant. This traject was already performed once in 1993 by Reinhold Meissner with his brother Hubert. Additional objectives are scientific missions, consisting in taking ice samples in order to check pollen, and another one dealing with observation and records of members behaviour in order to improve logistics of polar expeditions. The maritime expedition departure will take place in Brittany, french west coast, in the beginning of June 2006. Expedition leader is Dominique Simonneau. Boat skipper is Dominique Lavanchy (Dr.) from Switzerland. 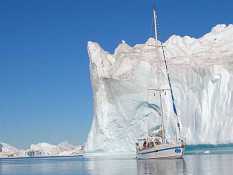 The sailing boat will join Reykjavik (Iceland) via west Ireland and then Nanortalik in the south of Greenland. The trip to Thulé on the Greenland west coast will be subject to ice and weather conditions. After Thulé and meeting with the ski expedition, the sailing boat will go back to Nanortalik, and then cross atlantic ocean to reach Brittany in the end of September 2006.